After a time of preparation, a new brother in the community makes his lifelong commitment. Here are the words used to express this commitment. Beloved brother, what are you asking for? The mercy of God and the community of my brothers. May God complete in you what he has begun. Truly, there is no one who has left everything because of Christ and the Gospel who will not receive a hundred times as much at present – brothers and sisters and mothers and children – and persecutions too, and in the age to come eternal life. This is a way contrary to all human reason but, like Abraham, you can only advance along it by faith, not by sight, confident that whoever gives their life for Christ’s sake will find it. From now on, walk in the steps of Christ. Do not be anxious about tomorrow. Seek first God’s Kingdom and his justice. Surrender yourself, give yourself, and a good measure, pressed down, shaken together, running over, will be poured out for you. Whether you wake or sleep, night and day, the seed springs up and grows, you know not how. Do not let your inner life make you look sad. Anoint your head and wash your face, so that only your Father who is in secret may know the intention of your heart. Stay simple and joyful, with the joy of the merciful, the joy of brotherly love. Be vigilant. If you have to rebuke a brother, keep it between the two of you. Always seek fellowship with your neighbour. Be open about yourself, remembering that you have a brother whose responsibility it is to listen to you. Be understanding of him, so that he may fulfil his ministry with joy. The Lord Christ, in his compassion and his love for you, has chosen you to be in the Church a sign of brotherly love. He calls you to live out, with your brothers, the parable of community. So, renouncing from now on all thought of looking back, and joyful with boundless gratitude, never fear to run ahead of the dawn, to praise, and bless, and sing Christ your Lord. Receive me, Lord Christ, and I shall live; may my hope be a source of joy. Brother, it is Christ who calls you and to him that you are now going to respond. Will you, for love of Christ, consecrate yourself to him with all your being? 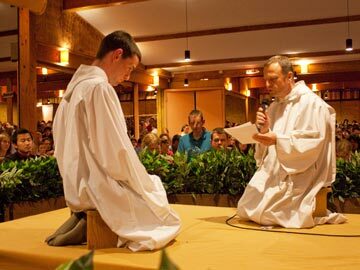 Will you, from now on, live out your call from God within our community, in communion with your brothers? Will you live with your brothers in the community of material and spiritual goods, which lies in all openness of heart? Will you, in order to be more available to serve with your brothers, and in order to give yourself in undivided love to Christ, remain celibate? Will you, so that we may be of one heart and one soul and so that our unity may be complete, accept the options of the community expressed by the servant of communion, remembering that he is only a poor man of the Gospel? Will you, always discerning Christ in your brothers, watch over them in good days and bad, in suffering and in joy? In consequence, on account of Christ and the Gospel, you are henceforth a brother of our community. May this ring be the sign of our faithfulness in the Lord.